The signing of agreement about the association between Ukraine and EC is suppose the exit on new lap of coordinating social, economical politic and politic in the sphere of climate and energy for Ukraine. Cooperation with the institutes of EC require of the abidance and striving to the achievement of common purposes and realization of the program, which are accepted to call “strategies” in EC. For today leading for EC is strategy “Europe 2020”, Politics of rallying 2014-2020 and also Frame policy of the European Community in the field of climate and energy to 2030 year. Ukraine synchronize their strategic documents with the seven-years programmed periods EC (in-process: 2014-2020) and takes point on the practical promotion of principles and purposes of the European politics of the branch and territorial development, founded in the functional strategy ”Europe 2020”. The EC strategy appeal the market to stimulate the private investments to the new pipeline systems, electrical nets and technologies with the low content of the carbon. The purposes are based on the detailed economical analysis, which helps economically effective to achieve decarburization to 2015 year. At the state level these concepts are fixed in the proclaimed by the President of Ukraine Strategy of steady development “Ukraine - 2020”, which determine the vector of the structural transformation in the economy and social sphere, and also in “State strategy of the regional development at the period to 2020 year”, which put the basis of the steady balanced development of the state. Agreement of the reforms in correspondence with these strategies must provide correspondence of Ukraine to criteria for supplying of request for the entrance to European community in 2020.
optimal structuring of regional energetic balance by means of substitution of natural gas by energy recourses and systems, which presented alternative kinds of fuel and energy providing, first of all at the objects jf social sphere. 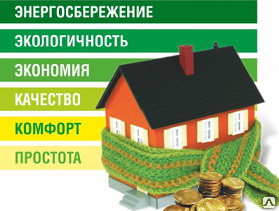 reconstruction and capital repair of residential houses with the using of energy-saving heating and technologies. Wolfgan Ringer – researcher from Austrian agency in the questions of health service and control of foods in his report «Heating and Ventilation Systems in Low Energy and Passive Houses in Europe» (2001) notes that regardless that exists rather high percent of people, which use gas, solid fuel boilers, heat pumps, Central Europe has high level of implementation of energy-saving heating technologies of premises. One of the most available, ecologically-clean and profitable technologies is the infrared heating. The modern radiant heating systems considerably exceeds gas boilers. In the context of scientific-researching project, technical university Kaiserslautern conducted researches and proved that the modern electrical heating, especially in old buildings become the source of economical, ecologically clean heat, promoting to the strengthening of health. The experiment was conducted not in the laboratory in the aseptic conditions, but immediate at the comparison of two equally dwelling houses with infrared and traditional heating system. In general, experts concluded: “This research shows, that the infrared radiation is the clever alternative to the traditional heating systems. The correct usage of infrared heating gives the advantages at the energy consumption, and from the point of view of cost and absence of carbon emissions. On the basis of estimates, it has been established, that investment expenses for the infrared heating make only about the half of costs to the gas heating, and necessary temperature is achieved more earlier, almost after turning on”. •They save more energy, than usual convective radiators. •They create the habitat, which is especially favorable for your health. •In spite of usage of electrical energy, they produce much less emissions CO2 in comparison with other heating systems and make maximal effective usage of renew sources of energy. •from the point of view of delivery, montage and technical service they are more cheaper than other heating systems, also have long term guaranty (5-10 years).